Experimente las playas de arena blanca, las aguas azules y las olas de la isla Nusa Lembongan en esta excursión de un día desde Ubud. Además de recorrer la isla, recorra el pueblo de Nusa Lembongan; disfruta nadando y buceando en un club de playa privado; y disfruta de un delicioso almuerzo de barbacoa. Experimente la vida en la isla con una visita al pueblo Nusa Lembongan. Tour de gran valor que incluye recogida y regreso al hotel. 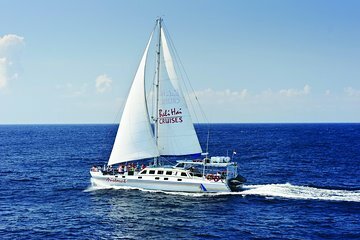 Su recorrido comienza con la recogida en su hotel de Ubud y un traslado al puerto de Benoa para abordar su velero, el catamarán "Aristócrata". Zarpe alrededor de las 8 am y empápese del paisaje en un crucero de 1.5 horas por el estrecho de Badung. A su llegada, salga a explorar el pueblo principal de Nusa Lembongan, y luego aproveche al máximo las instalaciones del club de playa privado de la compañía de excursiones. Pasee por los jardines tropicales, tome un baño en la piscina de la laguna, o disfrute de nadar y hacer snorkel en la playa, y luego vuelva a cargar el combustible con un delicioso almuerzo de barbacoa. Después de un día completo en la isla, regrese al puerto de Benoa alrededor de las 6.30 pm, donde un conductor lo estará esperando para llevarlo de regreso a su hotel. I'm not sure where to start, so I'll start at the beginning. We were picked up at our hotel, then moved on to pick up a second couple. They were no where to be found. We waited 45 minutes in a parking lot for this couple while the driver kept apologizing and tried to track them down. Finally they boarded, obviously ill, and I had to cover my face while they coughed and hacked the hour-long ride to the shore. Not surprisingly, we arrived late. As luck would have it, the boat was having mechanical issues, so we hadn't missed it. However, we ended up being put on a larger boat to get to the island. They offered to reschedule for the next day, but that wasn't an option for us. Though not the sailing experience we were hoping for, we had lovely seats, the staff served us drinks and were very helpful. We arrived at the island and received word that the catamaran was fixed and would be ready in time to bring us back. We took a couple's massage at the beach, enjoyed lunch, and went snorkling by a small reef, and enjoyed drinks and a view at the bar. We had planned on parasailing, but the weather wasn't safe for that windy and rain. We left on the catamaran, excited to finally enjoy our sailing experience. That quickly went down hill as the weather got worse. It was too choppy to sail, people were getting sick, so we had to run by motor. By the time we returned to shore, at least 80 of the guests were huddled in the back with used sick bags. Thankfully we were able to remain outside and enjoy the ride. Although everything went wrong for us, I have to say the staff on the boat were wonderful and we had a memorable day. My only negative comment would be that the staff on the island were not nearly as courteous. It was much more touristy than we had expected. I would love to try this again in better weather. Lots of activities included in the price which may be worth highlighting. The voyage to the island was very good on a sailing catamaran and the crew were attentive and friendly. The only slightly negative comment would be in regard to the serving of crackers with a thin slice of cheese on the transit from the island not the best choice in light of the temperature. On the island at the club, the BBQ lunch was good and the only negative aspect was the 'tour of the village'. This comprised everyone who had registered for this activity boarding a small truck with open sides and back from there we were ferried through the village to a point where there were a few stalls selling the usual tourist 'souvenirs'. The tour element involved our 'guide' discussing the change in economic circumstances due to the fact that no-one wished to harvest seaweed anymore and a long distance view of a bridge which connects two islands. Fantastic! Took our photo with a couple lovely Balinese dancers as we boarded. Great catamaran, sat up front on the trampoline -- not too crowded.. Nice ride over to beautiful beach with clear aqua water. Snorkeled, wonderful bbq lunch, free water/sodas, inexpensive massages. Great spot for tanning, yummy gelato available extra . Only wished we could have stayed longer! Ride back was accompanied by a friendly dolphin, waves we all got wet!, and a fabulous sunset. Recommend highly!